uuid : ed1bd229-6237-4ca9-b295-91b13b174e01 templates_id: 119545 templates_uuid: "d81f8b9a-de80-4488-904b-6725d7338c43" title: "Business Plan Template Free - How to Write a Business Plan " display_name: "Business plan" meta_keywords: "Business proposal and Business development plan" description: "
Secure the funding you need to help grow your business with this step-by-step business plan. Show potential investors why your product or service will be successful with a business plan that sets clear objectives and a strategy for growing your business. Writing a business plan will help you set a realistic timeline for repaying the investment while conveying confidence to potential investors. It covers the executive summary, business summary, marketing strategy and your financial plan. A business plan is a written document that describes business goals and sets out the financial, marketing and operational strategies to achieve them. It documents what your business is and how you are going to make it grow.\r\nIt is a fundamental prerequisite when starting a business, especially if you are launching a startup with high growth expectations. A business plan is particularly useful for any business seeking investment. It shows potential investors why your product or service will be successful by setting out clear objectives and a strategy for growing your business. Writing a business plan will help you define your long-term goals and set out a realistic timeline for repaying the investment, while conveying confidence to potential investors. An executive summary, or statement of purpose, is a short and precise description of your business, that is meant to grab your potential investors\302\222 attention when they first look at your business plan. It details the business purpose and operations, identifies the management team, and outlines the financial projections. Read Writing an executive summary and business outline for information on how to draft executive summary. What financial information should a business plan include? To elaborate your financial plan, read \r\nFinancial Information and requirements. What do I need to know before I complete my business plan? Ask a lawyer \r\n\r\nor read our guide on Writing a business plan. \r\n\r\n\r\n\r\n\r\n" created_timestamp: "2018-10-08 04:36:49.0" modified_timestamp: "2018-10-08 04:36:49.0" active: true created_by: 157 modified_by: 157 dcm_id: 244 url_slug: "Business-plan" meta_description: "Get help writing a business plan with step-by-step guidance from Rocket Lawyer. 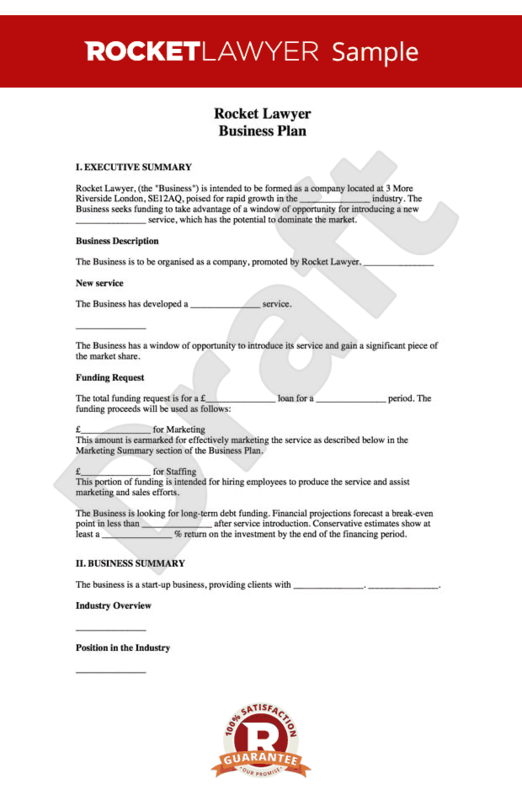 Raise money for your business with this free business plan template. Use this sample business plan." time_to_complete: "20 minutes " role1: "Business founder"
A business plan is a written document that describes business goals and sets out the financial, marketing and operational strategies to achieve them. It documents what your business is and how you are going to make it grow. It is a fundamental prerequisite when starting a business, especially if you are launching a startup with high growth expectations. An executive summary, or statement of purpose, is a short and precise description of your business, that is meant to grab your potential investors attention when they first look at your business plan. It details the business purpose and operations, identifies the management team, and outlines the financial projections. Read Writing an executive summary and business outline for information on how to draft executive summary. To elaborate your financial plan, read Financial Information and requirements. Ask a lawyer or read our guide on Writing a business plan. More than just a Business plan template, our step-by-step interview and guidance makes it easy to create your document. Easily create online, download, print and sign your free Business plan in minutes. This document is also sometimes called: Business proposal and Business development plan.